Most people decide to change the color of their home from time to time. This is certainly true of interior colors and almost always true about exterior colors. In general, most home owners don’t worry about making such a change because paints are available in many different formulas and thousands of colors. Owners of straw bale homes, however, have to consider more than just color when deciding on a new look for their home. The formula of the paint is very important because many paints will seal the wall completely and not allow vapor to pass through. 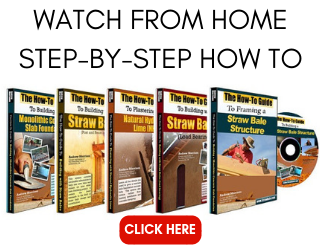 As you likely know by now, vapor trapped in a straw bale wall is a recipe for disaster. Oil based paints have been used for years and have great appeal for many applications. One thing they do not do, however, is allow moisture vapor to pass through them. For this reason, they should never be used on a straw bale home. Water based paints, commonly referred to as latex paint, will allow moisture vapor to move through them and at first glance would seem fine for straw bale walls. As you know, no two snowflakes are built the same, and the same can be said for paint. There are many grades of latex paint and the quality of the paint job can only be as good as the quality of the paint. Some paints run as high as $40 per gallon, while others can be grabbed off the shelf for $8 per gallon. What’s the difference? Quality. Part of the quality equation is based on the vapor transparence of the paint. 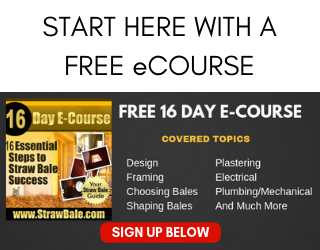 This is where straw bale home owners need to look deeper. Be sure that whatever grade paint you use, and I would recommend a high quality paint for sure, you choose one with a high vapor transparence. If you do not, you run the risk of trapping moisture in the walls and ruining your home, all for a color change. Many of the latex paints made today offer special advantages like weather sealing and mildewcides. Although they work well, they are anything but natural and may cause more damage to the home than they are worth, again, because of the trapping of moisture. Paints made to keep water out will likely keep water in as well. I always work with the understanding that water will get in and so I need to create an easy path for it to get out. I am aware that nature is more clever than I am! Another example of this is found in paint products made specifically for stucco. Although more flexible than standard coatings and very good at spanning hairline cracks and minimizing water infiltration, the elastomeric paint leaves a durable film that’s twice as thick (about 5 mil) as standard finishes and twice as likely to block water vapor from the inside. 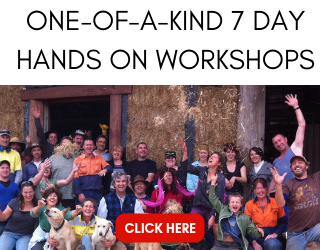 So what other options do straw bale home owners have? Plenty. First of all, I want to be clear that I am not saying latex paints are bad for straw bale homes. I merely want you to be sure to check the details of the paint you choose and be sure you will not create further problems for the home. That said, there are other, more natural options available to you if you are willing to work within the limitations and prices. One option is to use lime paints. They come in many beautiful colors and can be mixed to replicate colors not directly represented in the standard lime paint color palate. A great source for this is TransmineralUSA. You can contact them at (707) 769-0661 and ask for a color palate. These paints breathe, are durable natural, and beautiful. Be sure to investigate whether they will react properly with your substrate. In most cases, they should work well on straw bale homes. Another option is to use silicate paints also known as inorganic mineral paint. These paints are durable and offer a high breathability which is perfect for straw bale homes. They also provide a mildew resistant finish without the use of the mildewcides as mentioned in the latex paints. The natural minerals act as a mildewcide but are not scientifically created for that purpose, they are naturally occurring minerals. The source for the paint: potassium silicate, calcite, and chalk, among other natural ingredients, are abundantly available and provide excellent coverage and protection while maintaining the breathability of the wall. The silicate dispersion paints come in nine bold colors and can be diluted to over 50 standard colors. A little imagination can extend this palate even further. Another advantage of this paint is that it is odorless within hours and completely non combustible, no matter what the temperature. Many straw bale building codes require the application of a moisture barrier paint on the interior face of the walls. This is clearly a problem when it comes to building a quality straw bale home as the sealer would cause more problems than it would save. That is, of course, unless it is silicate dispersion paint. This material will actually cause water to bead up on the surface of the wall yet it will allow the vapor to pass safely through to the exterior and out of the house. This is yet another reason the silicate paints are ideal for use with straw bale construction. The cost of silicate paints is relatively high; however, the product is so durable, you will likely not need to refinish the walls for many years to come which, ultimately, makes the product less expensive in the long run. As you can see, there are no simple decisions when it comes to choosing a paint for your straw bale home. The best help I can offer is to urge you to pay attention to all the details and make decisions from an informed position. Don’t feel like the only color you can ever have on your home is the one you mix into the plaster. Know that you can change things down the line. If you are aware of the risks, and make your choices with those risks in mind, you will choose wisely and continue to protect and beautify your home.